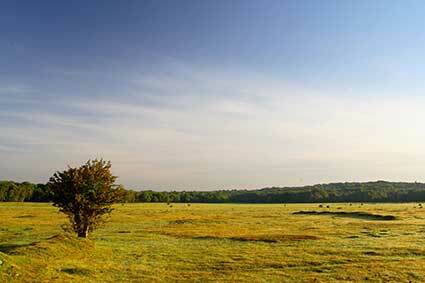 Balmer Lawn is an extensive stretch of grassland a short distance to the north-east of Brockenhurst village centre. Balmer Lawn until the 17th century was known as Palmers Lawn, but by the late-18th century, mapmakers showed it as Balmer Lawn. Somewhat confusingly, though, Henry Comyn in his 1817 Directory of Life in the Parishes of Boldre and Brockenhurst refers again to Palmers Lawn, not Balmer Lawn. There was some consistency, though, in the naming of the nearby river, today known as the Lymington River. Richardson, King and Driver in the late-18th century show it as Palmer Water; whilst Comyn refers to Palmers Water, but in the context of a nearby hamlet along the Brockenhurst to Beaulieu road - the hamlet name fell progressively from use from the early years of the 20th century. Heywood Sumner in 1923 recorded pony races on Balmer Lawn ‘which annually cause a complete change from the habitual, quiet Forest life….’. 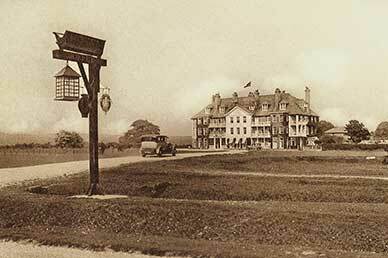 The 1898 and 1910 Ordnance Survey maps also show the presence of a golf course - the nearby Brockenhurst Manor Golf Club opened in 1908, and this presumably heralded the beginning of the end of Balmer Lawn golf. Cricket has been played in Brockenhurst since at least the late-18th century, in 1870, and probably earlier, in the grounds of Brockenhurst Park, but since the early 20th century, at Balmer Lawn. Now, at weekend throughout the season, this most traditional of English sports can be seen enacted against a timeless backdrop of curious cattle and ponies. Noticeable over much of Balmer Lawn is a series of close-spaced mounds, the dried-out bases of purple moor grass tussocks. As on many other New Forest grasslands, the mounds are now heavily grazed by commoners’ stock, a practice made all the more possible following extensive drainage in the mid-19th century. The lawn can, though, still be incredibly wet after winter rains, and must previously have been positively swamp-like. Some wild flowers, however, survive the grazing pressure. Devil’s-bit scabious, tormentil and lesser hawkbit grow well in the drier soils atop the mounds, whilst the nearby drainage channels host a variety of aquatic plants. The Balmer Lawn Hotel overlooks the grasslands, an impressive reminder of the days of grand, country houses. Apparently build as a private house or hunting lodge at the beginning of the 19th century, alterations around 1850 created the current form. Richardson, King and Driver, though, showed the site as land taken illegally from the Forest. In 1900, the building housed a pub called The Holt, presumably reflecting the presence of otters in the nearby river, and by the time of the Second World War, the pub name had changed to the equally appropriate Duck and Duckling. Illustrious guests have included King George V, members of the Russian royal family, Winston Churchill and General Eisenhower. During the First World War, the hotel was used as a field hospital for soldiers injured in action, many from New Zealand and India - the bodies of more than one hundred who did not survive are buried in the ‘New Zealand cemetery’, in the parish churchyard. In World War Two, the building was pressed into service again, this time as an Army Staff College, and was subsequently used for planning the Normandy invasion.